Go check out the recipe! I think these are more like muffin tops than cookies. No matter what you call them they're pretty yummy. This post is more of a meal idea than an actual recipe. It's really quick to put together and have a dinner in minutes! 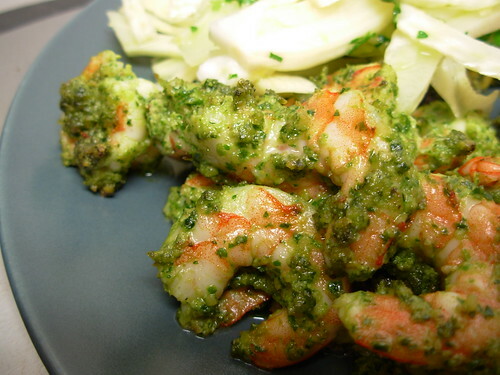 The basic premise is to thaw out some frozen raw shrimp, toss them in pesto, and broil them for 3 minutes (or until they turn pink). That's it! You're done! For pesto, I usually just throw whatever herb we have that looks good into a food processor along with whatever nuts I have. Tonight I had a big bunch of parsley, so I threw that in there with a handful of walnuts and a few green onions for bite, lemon zest and juice and a pinch of red pepper flakes for kick, and extra virgin olive oil to thin it to the right consistency. If you really like pesto, you can make a lot at once and freeze it in an ice cube tray, then pop the cubes out and store in a baggie - this way you can grab both the shrimp and the pesto from the freezer at the same time and make this even more of a convenience meal. I had some extra pesto tonight so I chopped up some zucchini and yellow summer squash, tossed them in the extra pesto, and broiled them too. We also had a fennel salad on the side. Just thinly slice a fennel bulb and dress with extra virgin olive oil and lemon juice. You can add some minced parsley, fennel fronds, or lemon zest if you want to get a little bit fancy. I really like ribs, but I hardly ever eat them since they're almost always covered in some kind of sweet sugary sauce. They intimidated me for some reason, so I never considered cooking some myself - they just seemed like they required a lot of equipment I don't have, like a grill or a smoker. Well I finally got over my fear of cooking healthy sugarless ribs at home with the following recipe. 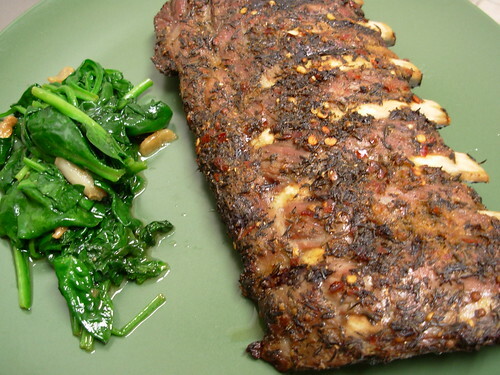 It uses a Jamaican inspired marinade followed by slow oven cooking to produce some nice tender ribs with a pleasing herby crust. I hope you'll enjoy it as much as I did! Combine all the ingredients in a plastic bag and marinate for at least 1 hour, but 3 hours is better. Preheat the oven to 290 degrees Fahrenheit. Line a baking sheet with foil and lightly oil it with some extra olive oil. Lay the ribs on the baking sheet and cover tightly with foil. Bake for 2 hours. Remove from the oven and drain any liquid. Heat up the broiler. Broil ribs meaty side up for 5 minutes to crisp up. You can double this easily and make some tasty leftovers. I had some leftovers for lunch the next day and they were great. Recipe is adapted from Eating Stella Style by George Stella. 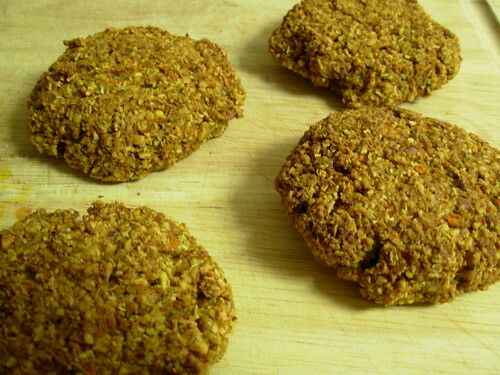 This recipe is part of the Natural Cures Healthy Recipe Blog Carnival over at Hartke is Online! I had a lot of foodie fun this weekend. 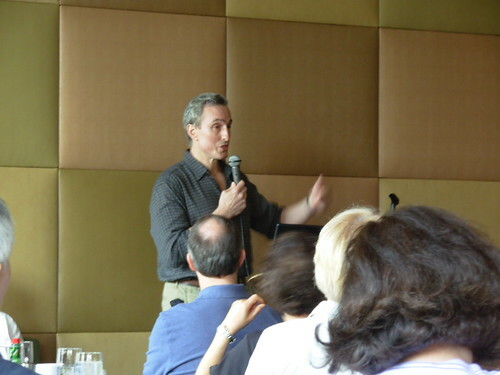 This morning I had the pleasure of seeing Gary Taubes give a lecture on his book Good Calories Bad Calories and even got to meet him for a minute afterwards and get my book signed and a quick answer to a question. I asked him if he ever thought low-carb had a prayer of gaining mainstream acceptance and he said that if anything he foresees a cognitively dissonant compromise - that carbs are bad but that fat (especially saturated fat) is also bad. After the Taubes breakfast my sister and I headed off to another lecture given by a book author, The Liberation Diet. by Kevin Brown. He was a pretty engaging speaker and spoke out very strongly against all forms of modern industrialized food. I spoke with him a little before and after his presentation and I may have an opportunity to work with some of his clients by helping them change their diets by coming to their homes and cooking for them! I'm pretty excited by this idea and I hope it pans out. The Liberation Diet meeting was a potluck and the dish I brought was these Lemon Curd Bars which I found over at The Nourishing Gourmet. If you use coconut oil instead of butter, these bars make a great occasional primal treat. I would have a picture for you but the pan got devoured pretty quickly; rest assured they looked exactly like the original and tasted amazing! The lemon curd is simple, just five ingredients, but beyond delicious. Even if you don't make the nut bars to go underneath, the curd is really something special.